"Poodwaddle works steadily, and arduously, to meet his looming deadline." One of the most prevalent questions asked of any panel at any comic convention is "how do I break into comics?" It's a very complex question that requires a fantastically nuanced response, but in short there's no one way to do it. Those who have made a living in comics will tell you it's not easy and not nearly as glamorous as one may hope. Image Comics offers up a very blunt take on the industry in Pencil Head #1. The issue is written and illustrated by Ted McKeever. Journey along and witness protagonist Poodwaddle's trials and tribulations of working, and sustaining, his place in the absurd world of comics, where what happens behind the scenes is far more twisted, and bizarrely hilarious, than anything on the printed page. Poodwaddle is the vehicle for McKeever's frustrations with the comic book industry, as he's a freelance comic book artist working at Happy Time Offices. It's a pretty basic story that's steeped in symbolism as far as McKeever's visual representations of the gamut of emotions a freelancers encounters. As any talent in the industry can tell you there are some encounters that are too real to be made up and McKeever incorporates such flights of fancy in Pencil Head #1. Much of the first issue is focused on some of the more "routine" frustrations faced by a freelance comic book artist and are offered in a way that incorporates a surreality that's meta in many ways. There is some silver lining to the book though, as Poonwaddle's friend Luthais is the more successful artist and provides a contrast that reminds readers it's not all gloom and doom. Adding another layer of intensity to the work is McKeever's illustrations which are purposefully exaggerated. Poonwaddle sports a somewhat rugged and tired look, befitting of an artist toiling away to meet deadlines (both editor and self-imposed). Other characters are depicted as monstrous entities, further underscoring the notion that many of the players in the comic book industry are pretty vile at their core. There's definitely a hyperbolic approach to the artwork that reinforces the notion that there's a "scary monster" aspect of fears that plays out in our minds. McKeever uses those monsters to great effect though, effectively creating a looming presence that always seems to be waiting on the next page. 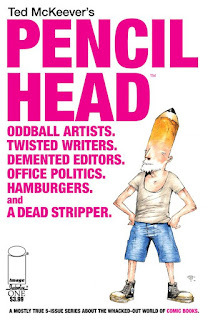 Pencil Head #1 is a very dark (yet painfully accurate) take on the life of a freelance comic artist. There's a lot of satisfaction in going freelance as it gives one tons of flexibility, but you're forced to contend with the business side of the industry as well, which may not always be on the same page. McKeever's industry experience contributes to a story that's semi-autobiographical and infuses Pencil Head #1 with plenty of real experience. His artwork offers the right amount of satirical levity to what are otherwise pretty discouraging exchanges. Pencil Head #1 is a great read for any comic book fan, but there's an extra level of silent nodding available to those creators within the industry. Pencil Head #1 is in stores now.